For those who have ardently followed UFO over the years, there is nothing here that you don't already have. There have been countless UFO collections over the years, with the amount of compilations and live albums (official and otherwise) enough to keep the most ardent of UFO collectors on the bread-line. So what if anything sets this new compilation apart from those other releases? Firstly the fact that the decade in question is actually the current one, and secondly is that unusually for any UFO collection that includes studio material, is the total absence of the Mad Axeman himself, Michael Schenker, even though he did appear on 2000’s ‘Covenant’ and 2002’s ‘Sharks’ albums. For those unaware, the current and slightly less mad guitarist this album covers has been the shred-meister himself Vinnie Moore, who up until his surprise recruitment into the UFO ranks had been best known for his instrumental albums that set him apart as one of the most gifted and song orientated of the fret burners. Since Moore joined, UFO have released three excellent studio albums – ‘You Are Here’, ‘Monkey Puzzle’ and ‘The Visitor’ – and one live album – ‘Showtime’ – all of which are plundered for this release. Ten of the sixteen tracks on show are from those studio albums and the likes of ‘Daylight Goes To Town’, ‘The Wild One’, ‘Mr. Freeze’ and ‘Baby Blue’ prove that UFO have lost none of their attack or poignancy, and contrary to popular opinion that their best days are not all behind them. Moore adds a freshness to the band’s sound without ever losing the bluesy edge that has always been so important to UFO, and it is to his credit that he never feels the need to resort to the blistering fret work that made his name. As all the best musicians do, he plays for the song and hits the mark every time with his faultless guitar work. Phil Mogg also sounds remarkably strong considering the punishment he has given his voice over the years and there really are few bands who still write songs this relevant at the end of their fourth decade. Why it was deemed necessary to then pepper the album with six live tracks, admittedly with Moore on guitar, that have been released almost as many times as they have been performed, is rather confusing. That’s not to say that these versions are substandard, far from it. The band are tight, Mogg sings the songs like he was still in his youth and Moore proves to be a match for any of the band’s previous six stringers, it just would have been good to hear some new tracks live that are more in keeping with what this album seems to set out to achieve. 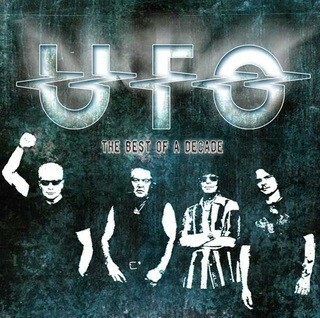 For those who have ardently followed UFO over the years, there is nothing here that you don’t already have, and while the studio tracks are great songs, if they are new to you, I would recommend you actually invest in the albums they originally came from rather than this compilation.